I don’t know what’s wrong with me but I have to say I was mildly unnerved the first time I eyeballed Soy Saucy Chicken and Eggs. There was something so, well, here-is the-chicken-and-here-are-her-eggs-sitting-next-to-her about it all. I know that’s irrational on many levels, but work with me. This is definitely a fun weeknight dish but you need to be ready, like the back row players in a volleyball match, because the serves -- in the form of steps -- start coming at you if you’re not. Pour the wine! Chop that garlic! As soon as you get your eggs on, start thinking about what you’re going to serve with this. In my case, it was basmati rice, and I regretted not getting it on a bit earlier, especially since the directions on the canister were in several languages, not one of them English, requiring a quick rice-cooking refresher course on the Google while my heat was a-flamin’. While your eggs are cooking put your garlic and ginger on; monkeymom does not tell you to do this in oil but I will. I considered sesame, to get in the Asian spirit of the dish, but went with vegetable so as not to mess with the flavors. I might try it next time with the sesame. Next you brown up your chicken, and then you start deglazing and adding the other stuff. I wasn’t clear on whether I was meant to take my chicken out for that process, she doesn’t say, so I left it on and worked around it, all at a low heat. The cooking time once you get your peeled eggs on is closer to 20 minutes than 25 in my view. The tomato, as others have commented, really makes this dish -- it’s tangy, noted the husband -- and bacon girl, who is generally loathe to try new things, chowed it down. I am not suggesting the palate of an 8-year-old girl who won’t eat fruit be your culinary guide, but just explaining that this is a crowd pleaser. I will continue to tweak its seasoning; for example both diners said they did not taste the soy at all. Hm. Addressing next time. Further, while I loved the sauce and the eggs dipped in it, I found the chicken a tad bland; I believe this is because I used skinless thighs rather than, as the author suggests, using a mix with some skin. Skin is flavor, people. Without it, I suggest hot sauce. This is indeed a terrific dish - I've made it several times and it's always a hit. In fact, I haven't planned dinner for tonight yet...thank you for the inspiration! do you have special tricks you do? changes to the recipe? I've increased the amount of soy sauce to about 3/4 cup since we love the flavor, and I use both fresh tomatoes and tomato paste. Last night I subbed in sliced green cabbage for the mushrooms and it was delicious. I made this tonight and I also used closer to 3/4 cup soy sauce. I also seasoned the chicken while it was browning, which I think helped. Served with rice and a side salad, it make a tasty dinner. Thanks for highlighting this recipe! Hey Jenny, so glad that the family dug this. This is definitely a 'suit-to-taste' one-pot easy dish. Don't bother taking things out of the pot! Make things easy on yourself! Also, as to the blandness - yay skin! Also, adding more soy or flavoring help. Letting it sit overnight also helps the flavors get into that chicken better too. Leftovers are yummy. I love checking in on Mondays to see what you are up to! This was a nice surprise. yes it's a winner. i am traveling so left it for left overs for the fam! Thanks for reminding me about this dish! 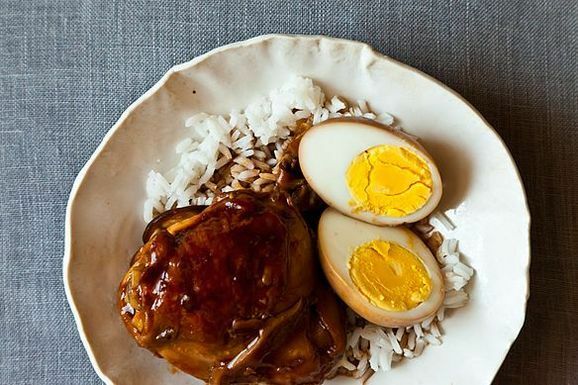 One of my favorite F52 recipes that I haven't made in a while. I love this dish - in Chinese it's called "Mother and Child Reunion". Kind of creepy, but delicious.